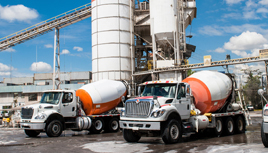 A great feature that our concrete company customers like is our dispatching software that allows you to setup routes for the day. Have you ever had a location that needed more concrete and you just weren’t sure who was the closest to the location? Using our software, you can find the closest trucks and then send that to the device of the truck you want to send to the location. It’s much faster than calling all the drivers to see where they are and trying to give them directions over the phone!